I like going east – all the way to the coast; I like the coast a lot, but I also like the history. The 2012 National Interpretation Workshop was in Hampton, Virginia. That’s almost to the oceanside boardwalks of Virginia Beach and is in the oldest part of the region. 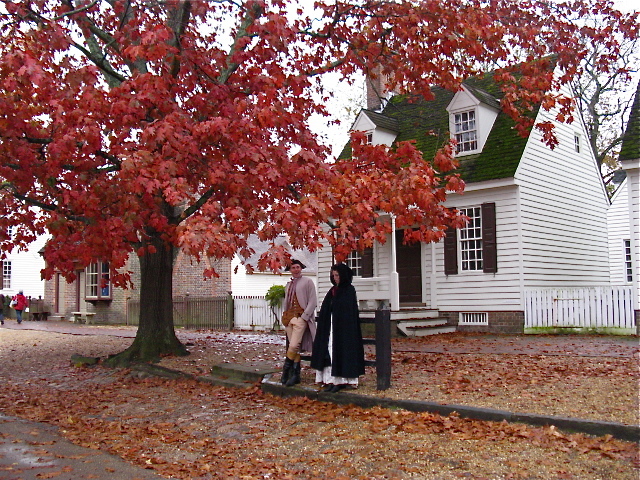 Nearby are Jamestown, Yorktown, Williamsburg, and a small church on the Isle of Wight. There are remarkable historic sites, homes, streets of taverns, and museums that are not quite so famous, but each telling a fascinating bit of our nation’s history. A little over a year ago I was asked to speak at a conference on historic sites and museums. The theme was ‘Telling Difficult Stories.” I was pleased to be last on the program and thereby able to hear other speakers and in my presentation connect their comments to the several things we do that address difficult stories. As I listened to the remarkable speakers my eyes opened to the obligation, yes, obligation, that historic sites and museums have to go deeper into the lives of people and the practices of society as we tell the stories of our sites. When I started working here, our 1870s train station at Mammoth Spring had ‘Colored Entrance’ painted on the back door. Today in that station we tell the story of the ‘separate but equal era.’ At Historic Washington the lovely townhomes of the rich and famous ONLY exist because of the slave population out on the plantations. We are just beginning to tell that story. So it is that I have become very interesting in pushing the depth of interpretation, to peopling our parks with all the population, and telling the whole story, not just the easy, pretty story. 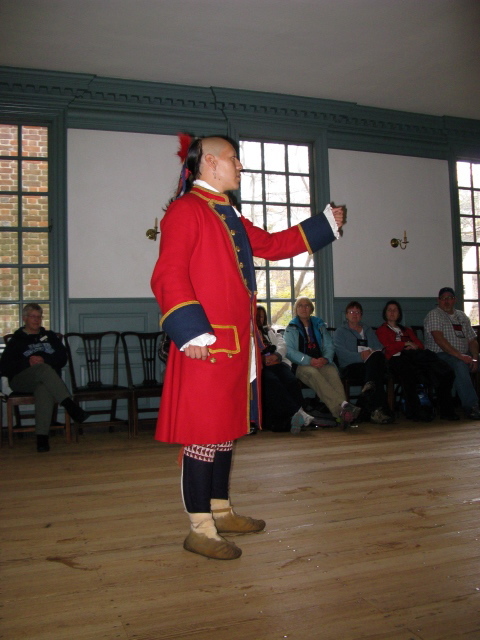 When I saw the agenda for the 2012 National Interpreter’s Workshop, I immediately signed up for a 2-day pre-workshop entitled “Stories That Must Be Told,” presented by NAI’s Cultural Interpretation and Living History Section. I’m glad I did. Both days were outstanding, emphasizing interpretation of African Americans and American Indians. A lot of this was about awakening our awareness that these people were here. Once that awakening occurs, a good interpreter is practically compelled to research, find those stories, and incorporate them into dynamic, emotional, memorable experiences. 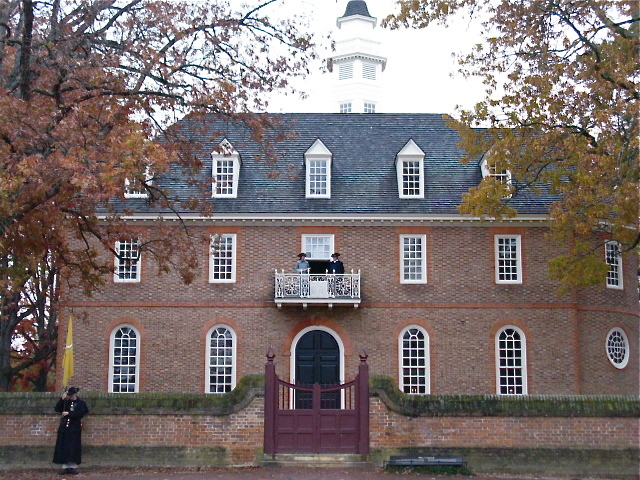 The second day of the workshop was held at Williamsburg. I’ve been to Williamsburg many times, but this trip was different. 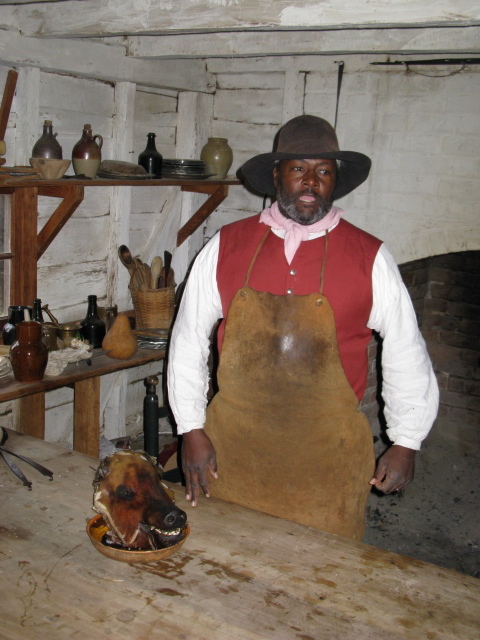 We were behind the scenes talking with people who portray enslaved people. Over half the population of Williamsburg was black, yet for years all interpretation and restored property focused on the big homes and lives of whites. That is changing as they work to incorporate ‘the other half’ into the Williamsburg story. Also, American Indians have been largely ignored. It’s as though once that first Thanksgiving (OK – wrong place) passed, we simply ignore the American Indians. However, we learn that Williamsburg was the center of negotiations with many tribes and American Indian leaders stayed in Williamsburg for lengthy political and other visits and were a fairly common sight on the streets there. They were dignitaries of nations and held in high regard. 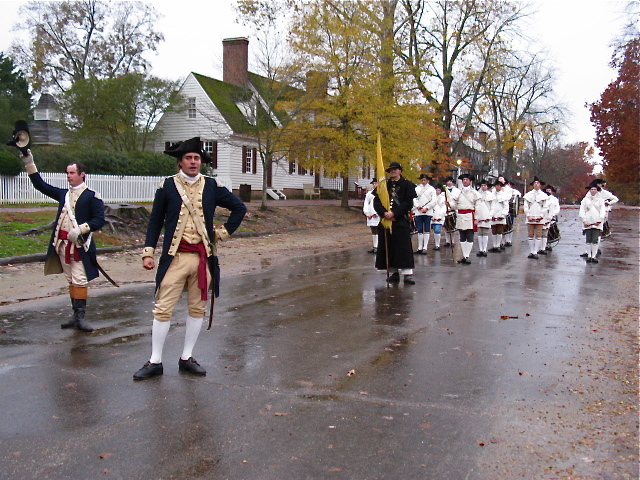 Their story is important to understanding Colonial and Revolutionary America, which is Williamsburg’s era and story. These stories aren’t all nice and tidy, they tell the ugly side, the difficult side and try to show several perspectives on people and slavery and human and political relationships, and freedom. This has created a new and deeper Williamsburg experience. We were able to meet interpreters/actors and not only see their character, but hear them talk about their passion for the topic, about their dedication to good research, and their commitment a good portrayal. They are treading new ground for Williamsburg and for each visitor, and they recognize that their portrayal of characters and events is critically important and must be accurate yet sensitive. I was impressed that there was a clear and specific flow to the Williamsburg experience, but it’s not obvious. You can experience this place in many ways. Just walking the streets is wonderful. Buying a ticket and taking tours and hearing programs in the many buildings is wonderful. Specialty tours like the early morning garden tours and the evening theatre are wonderful. Yet most of the town and activities are free, outdoors and in public areas. Then, about 4pm-ish, things subtly shift. 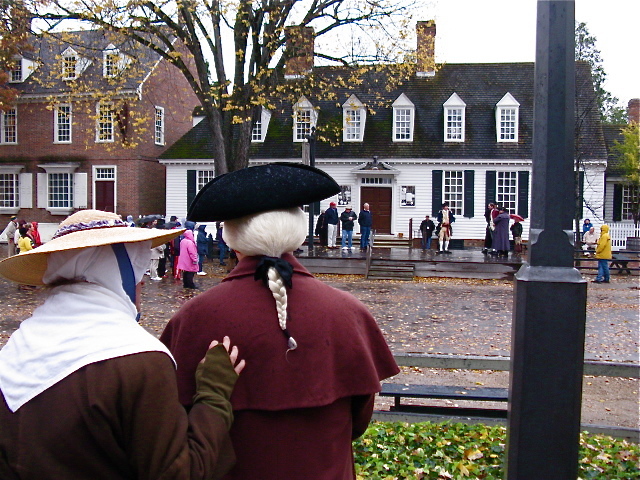 House tours subside and costumed interpreters greet each other on the street, chat about 1776 events and meander toward town center, a block from the courthouse. There a kangaroo court with charges of “Rebel” or “Tory” unfolds around you. Costumed people standing in the crowd with you whisper and engage you in small conversation, perhaps asking where you stand, as though you are their neighbor making the same decisions as they about the dire possibility of a revolt against The Crown. Yelling is heard to the east and the crowd moves as one, downhill and behind the buildings into a not-so-public place and another conversation begins, a secret conversation in hushed tones. Africans are talking about a different kind of freedom and an offer from the British to fight for them and be free. The crowd is left to think about this as the interpreters run into the bushes away from the authorities. A moment later a canon is fired and fife and drum are heard. The crowd, like a flock of blackbirds careening through the air as a single unit, rushes back to the street where the fife and drum corps is escorting a recruitment officer into the crowd to find men who will volunteer to fight for freedom from England. We hold these truths to be self-evident, that all men are created equal, that they are endowed by their Creator with certain unalienable rights, that among these are Life, Liberty and the pursuit of Happiness.— the Declaration of Independence! A few lines are read from the balcony as we look and listen, then the next lines are said nearer the street by a common person, then other lines by a person to your right, then another to your left. People you have seen in costume throughout the day are here, stepping out and proclaiming unalienable rights and freedom! … and it is powerful. The voices fall silent, and you think about rights and the definitions of freedom and the limits of freedom that you have witnessed this day. Suddenly the canon fires, fifes play and drums roll. Shouts of “Huzzah, Huzzah!” fill the air. The crowd moves, breaks into small groups and slowly fades away … the day at Williamsburg is over. It was interesting to realize the non-randomness, of the randomness of the day. You choose what to do, you craft your own experience, yet whatever experience you choose, each is tied to the day’s finale of events. Is that what John Muir meant when he said: “When we try to pick out anything by itself, we find it hitched to everything in the universe?” Probably not, but maybe that’s what well-planned interpretation does – it connects everything to the main thing! And you already know, to be a good interpreter you must know what the main thing is, and – The main thing is to keep the main thing, the main thing! The Williamsburg finale is carefully planned to capture everyone’s attention, to create in the street a group of unrelated people, then move that group as though with an invisible hand, to a final, powerful conclusion wrapped in the intangibles of courage, values, honor, persistence, hope and freedom. Each of those is now set in your mind from the several and very different perspectives of the different people of Williamsburg. This could not happen with the memorable force it has without including all the people of Williamsburg. I challenge you to look for the story you are NOT telling. Look for the people NOT represented. Look for the different perspective and tell the difficult story. People your place with all the people, and let their ideas flow. Next Next post: Do you mean the big W?